October has been an exhilarating month for Mohawk Music! And as we move into November, we'll have several events that you definitely won't want to miss. Below you will find a recap of our recent successes with performances and fundraising, followed by info on our upcoming events. The High School Concert Chorus traveled to Keene State College for the Cantate High School Choral Festival last Friday, October 24 - and they had a fantastic day! High School choirs from all over New England had gathered there to perform in the beautiful Redfern Arts Center, receive coaching on stage by college music faculty, and learn about how to reach the highest levels of vocal performance. Mohawk was the last high school to perform, and once on stage our singers rose to the occasion and delivered a particularly outstanding, high-spirited performance. They sang with confidence, clarity, and sophistication, and conducted themselves in a way that won the audience's admiration and respect. Dr. Sandra Howard, who coordinates the event every year and coached our singers after their performance, said that she has loved hearing Mohawk over the last three years because "not only has the program grown in size, but it's also grown remarkably in quality." She also asked the audience, "Do they look like they're having fun singing or what?" This was great confirmation that our chorus is achieving higher levels of quality, and that our students are definitely enjoying themselves in the process. So our performance was thrilling, but the whole event was an extremely rich learning experience and there were many highlights. Our coaching on stage with Dr. Howard was enlightening, and we also received written comments and suggestions from other members of the college's vocal faculty (we now have many new things to work on in class!). We also heard magnificent performances by the Keene State College Choirs, which gave our students a sense of what professional quality looks and sounds like. Our students also had opportunities to meet and mingle with students from other schools, and the event closed with an "All Sing" in which everyone performed together as a massive choir. It was an incredibly successful, inspiring, and satisfying day. Although, for some it was bittersweet. When we were back at Mohawk, one of our seniors who recently joined chorus said "I wish I had joined chorus sooner! I'm just getting into this now and it's my last year!" But having had this positive experience so early in the year, our singers will be poised for a very successful year of singing. Congratulations to our Select Chorus and our unplugged rockers Acoustic Toast, who performed at the Ashfield Fall Festival on Sunday, October 12! The weather was perfect, and our groups kicked off the day of performances on the town common with a great set of music for an appreciative audience. Thank you Larry Parnass for inviting us to be part of the festival! Thanks also to the Ashfield Congregational Church for providing us with a warm-up space. We're already looking forward to next year! 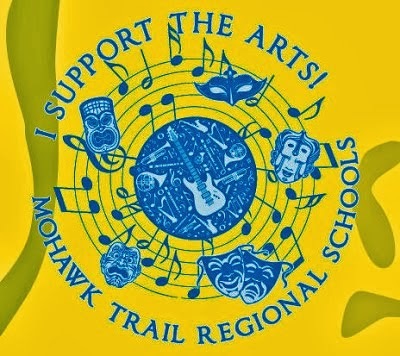 Mohawk Music students and parents have done some serious fundraising this month. The Mohawk Music Association's Booster Day Pie Sale was their most successful to date! They had more pies donated to the sale this year than ever before, and the pies were completely sold out by the end of the evening. Then at the Ashfield Fall Festival, the MMA's Baked Potato Booth also did very well this year. They didn't quite break the record set last year, probably due to the weather, but nonetheless they still had a very successful weekend raising funds to support music students at Mohawk. Thank you to all of the families that contributed to these important fundraisers! Students in the Tri-M Music Honors Society also led three successful fundraising events this month: one car wash at Mohawk and two "Bake and Busk" events in Shelburne Falls. They raised over $700 with these events! Proceeds go to the competition trip to Virginia this spring - specifically to the cost of transportation. The goal is to cover the transportation cost for this year's competition trip: $5251. After this month's fundraising and contributions by the MMA, we are about half way there! We have approximately $2500 left to go! Students have also been undertaking their own fundraising to defray the costs for their trip to Virginia. Several students have received sponsorships from area businesses, and most students participated in a Florida citrus fundraiser. Starting November 10, Students participating in the trip to Virginia will be offering valuable coupon books for sale. The books will be sold for $25 each, and they include some great coupons to Big Y (10% off entire purchase - no matter how big!). The Big Y coupons make the books well worth the cost! Ask a music student for more information. Tote Bags are still available, too! These are very practical, and they make great gifts! You can find them in the Local Goods Catalog, and also at the MMA website. Ms. Glover and I are excited about the upcoming trip to see "Aladdin" on Broadway! About 85 students and chaperones will be participating in this special trip. Mohawk Music's loudest, most rocking concert of the year is coming up in just a few weeks! Mark your calendars for Friday, November 7, and get yourself, your friends, and your family down to the Mohawk Auditorium to shake a leg and support a good cause! Mohawk Rock Band students will be the opening act, sharing their work with a great set of tunes in the first half of the concert. Our special guests and headliners will be Trailer Park, featuring Mohawk Music alumnus Tom Mahnken on bass and vocals. This will be Trailer Park's third performance at Mohawk to benefit the MMA! According to the Recorder: "...Trailer Park has been the Pioneer Valley's go-to party band, proving time and again that it can entice even the most reluctant among us to get out on the dance floor." So come out and bring your dancing shoes! You won't want to miss this! November 7. 7pm. Mohawk Auditorium. $10 adults, $5 children, Mohawk Students FREE. Proceeds benefit the Mohawk Music Association. Concessions will be available in the lobby. This meeting will include preparations for the Rock Band/Trailer Park concert. Parents, please come to participate! 6:30pm, Mohawk Library. Concert Chorus will be performing at the Mary Lyon Spelling Bee on Nov. 13, 6:30 in the Mohawk Auditorium. Select Chorus will be joining Hilltown Harmony for a benefit concert on Nov. 22, 3:00pm, Trinity Church, Shelburne Falls. Winter Concert, December 9, 6:30pm, Mohawk Auditorium. Field trip to Broadway/NYC on November 5: The following is a list of information and an itinerary for the day. ● We will be travelling by coach bus. Students may bring DVD’s PG-13 and under. We will vote on the bus for movie selections. R rated movies will NOT be chosen. ● Students may bring electronics, however ipads, ipods etc. will need to be left on the bus while we are in the city. The bus WILL be locked. Students may bring phones with them. ● Students will need money for food only. We will not be shopping. It is suggested that students bring at least $20 to cover both meals, however students may bring a lunch/dinner and eat on the bus. ● Please dress appropriately! School dress codes WILL apply. It may be chilly/windy in the city so please plan accordingly by bringing hats, jackets and even gloves! ● When we are in Springfield students will be calling home to notify parents that we are about an hour away. If your child does not have a cell phone, they may borrow one to make this phone call. ● This is a “non-performance” trip. Students will not need music or instruments. ● Black dress pants - NO jeans or stretch pants - shirts will need to be tucked in. ● Black dress shoes - NO flip-flops and no sneakers with white laces/or any other colors on them. Plain black please! Students will receive a white tuxedo shirt, black vest and a blue bow tie. Vests and bow ties will remain at school. Tuxedo shirts should be taken home to wash in between performances. Winter Concert: Our Winter Concert will now be held on Tuesday, December 9th at 6:30 pm in the auditorium at Mohawk. Great Weekend at the Ashfield Fall Festival!